Across the Metro Nashville Schools district this week, hundreds of teachers and parents are rallying before the morning bell. 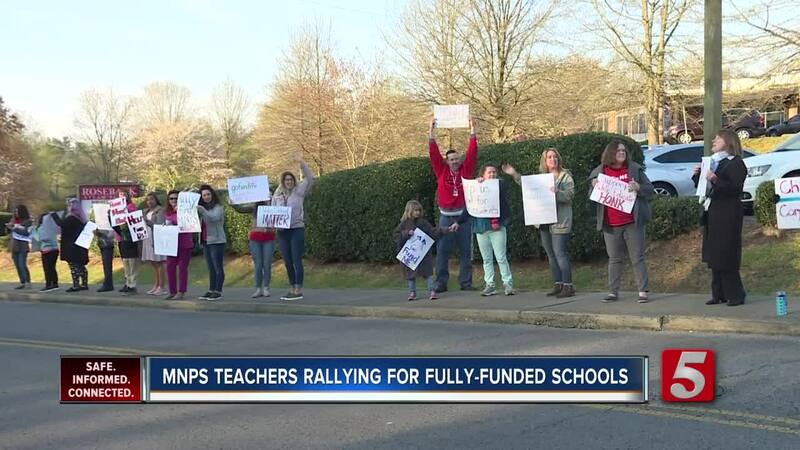 NASHVILLE, Tenn. (WTVF) — Across the Metro Nashville Schools district this week, hundreds of teachers and parents are rallying before the morning bell. Tuesday night, the school board budget committee voted to ask the city for an additional $77 million next year. It would give teachers and other support staff a 10 percent cost of living raise as well as provide more resources for social and emotional learning for students. This is something Metro school teacher Amanda Kail says needs to happen for students to have a better future. "We know it's a big ask we know that funding public education doesn't come easily but we know it's in the best interest in our kids," said Kail. All across the district this week, parents and teachers have been out in force, holding signs and encouraging folks to support a fully-funded school district. Kail says the district is losing too many good teachers every year because we simply don't pay enough. In fact, currently, Metro has more than 220 classrooms without a permanent teacher, meaning kids aren't getting the education that they deserve. "We're not funding the people who do the work inside the schools," said Kail. Katherine Green is a 4th grade metro school teacher and she says they are showing solidarity by having these rallies. "Maybe this will start conversations about what teachers need," said Green. It's against the law for teachers in Tennessee to go on strike so they will continue these walk-ins before school through early next week. The walk-ins are happening before the start of the school day so classes aren't being disrupted.